‘nuf said! We packed up the kids and drove the 20-or-so blocks to the Garden District, where friends Katrina and Carmello had quietly opened their beautiful, much anticipated, gelateria for the evening. Walking up to the door, we spotted a familiar bright orange hat (favors from Ana’s party — same ones we wore to MG parades) and came up to find their son, 4-year old artistic genius Nicco, munching away on a panini. “Wanna panini?” he asked us between bites. We explained we were in for the gelato. His favorite flavor? “STRAWBERRY” he said with huge eyes. Although the Nicco endorsement was hard to pass up, being me, I had to try something new. (Katrina and Carmello brought delicious strawberry gelato to our Abeona Krewe Ball, so I’d tried it before.) I went for the Stracciatella, which is Italian buttercream with pieces of chocolate inside. Paul and Will went for variations of chocolate. It’s sort of like the best chocolate chip ice cream you’ve ever had, except better. Denice and family were there, too, so Will had a great time playing with classmates while we parents hung out. The restaurant itself is beautiful. An adorable bright white house on Magazine Street, a few steps from other fun Garden District eateries and shops. Inside, a kids table holds tinker toys around brightly colored kid-sized chairs — all in fun, retro shapes. Two are in the shape of animals that the kids can sit on! The “adult” sized tables and chairs share the throwback theme. The space is open, clean, and very friendly. Paul told me that La Divina holds a special permit as the only ice cream/gelateria in the city who is authorized to make all of their products from scratch on-site. The tastes are full, rich, and creamy — without question, divine. Locals: check out La Divina! They’ll have their Grand Opening sometime in the next month — we’ll announce it when we know!! Our house was too ill to attend Saturday’s Jazz Funeral for Helen as we’d planned. But photos can be seen here. – The kids’ ladders are fabulous. A MUST. – Bring a step-stool, too. 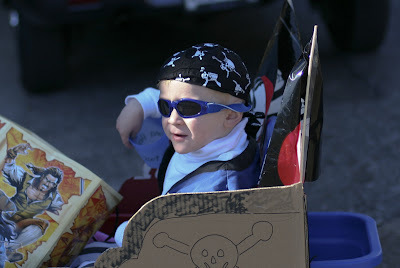 – Wagons are a great asset with two kids and frequent parades. We love ours. 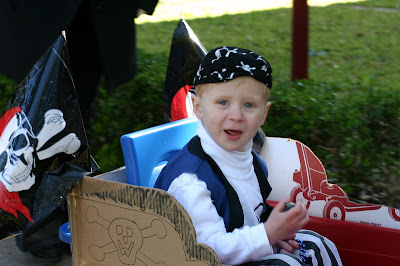 – Kids wear tons of costumes for Mardi Gras parades and events. 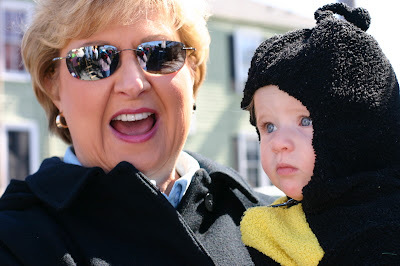 – Parents wear costumes, too. 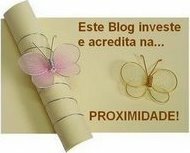 – Keep boas, hats, and wigs readily available… year round. – Paul should get a used tux, have it fitted, and keep it on hand. – I should have an assortment of dresses on hand. – If you get a throw in a bag, keep it in a bag so that your kid can use it in their school parade next year (it’s easier to throw things in bags). – Pack flashlights for night parades. 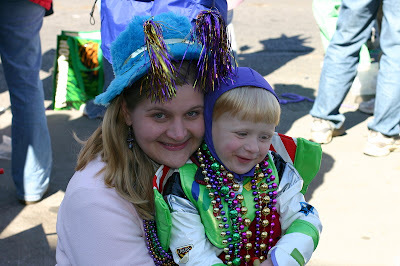 – It is awesome to share Mardi Gras with family and friends. – Paul and I want to ride on a float; I’m considering joining Muses. 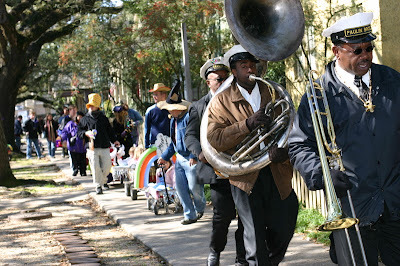 – Take time off BEFORE Mardi Gras to rest and prepare for the long week. – Cancel everything for Ash Wednesday and stay in bed! 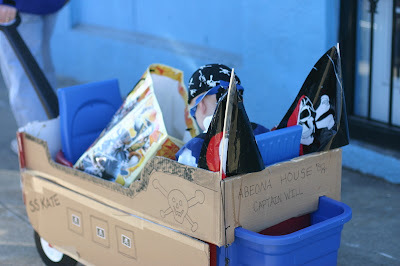 For our household, Carnival ended on Sunday. The stomach bug that has been rolling around town hit Will… HARD. 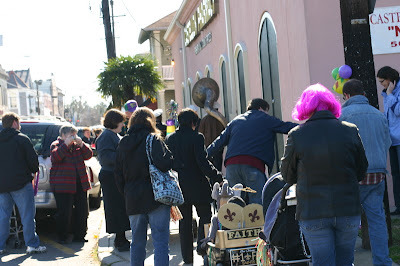 Lundi Gras, we managed to get a babysitter so that we could go out to dinner… only to cancel as Will worsened. For two days, the little guy couldn’t keep anything up or down. We came close to taking him to Children’s hospital several times. Our pediatrician called in prescriptions for us (phengrin) and between that and fever-all, we were able to control his nausea and fever. (Note: Will doesn’t take medicine… so both are suppositories… how’s that for fun?) Us adults weren’t feeling 100%, either, so we all took a breather. 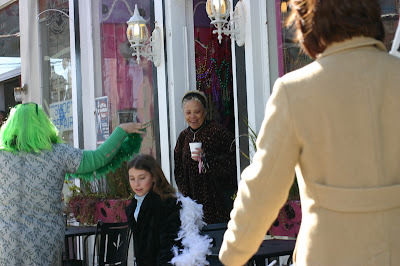 Mardi Gras excitement can take a lot of energy! Matt and Laura left on Tuesday and we were so happy to have shared the holiday with them. Thanks! After Thoth, Granna and PapPap stuck around to spend some time with the kids. They (of course!) brought presents. Our Buzz got his own Buzz: Kate’s toy took PapPap awhile to unpack. And then Kate entertained everyone with her bye-bye waves and crazy girl moves! We finally got home and to sleep in the wee hours of Sunday morning. 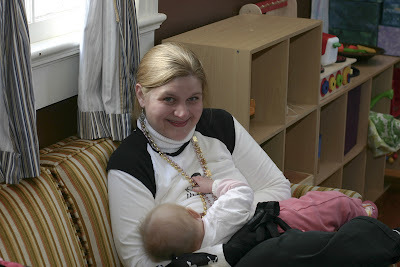 A few hours later, we awoke to Will’s cheery morning voice brightly calling out, “Mommy! Daddy! It’s a BEAUTIFUL DAY! 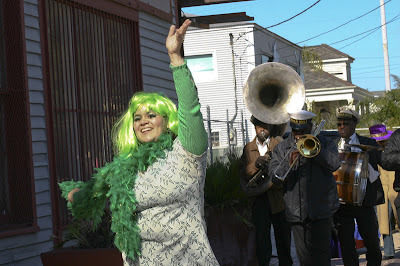 !” And so began our Mardi Gras Sunday. 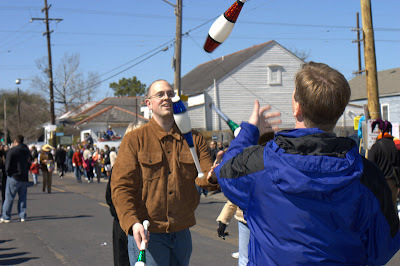 Adrenaline must have still been going from the night before, because we got up and started preparing for Thoth. We weren’t sure who would show up at our door (because we’re right on the route, we announced our house as a home base with breakfast food and clean bathrooms. 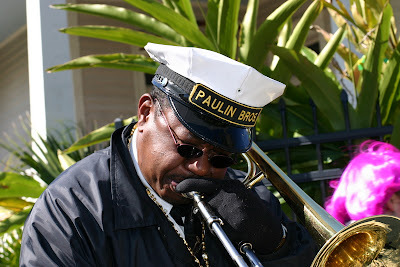 In years past, the neighborhood has had a block party with live music, food, and dancing.) We had picked up quiche and fruit from Whole Foods the day before and were ready for guests, should they arrive. Some friends did come by, but there wasn’t a lot of time to do more than grab a bite to eat and walk to Magazine to set up the kids’ ladders. 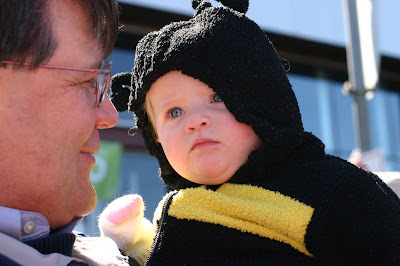 This year, the whole street seemed tired; apparently we weren’t the only ones feeling a bit long in the tooth! 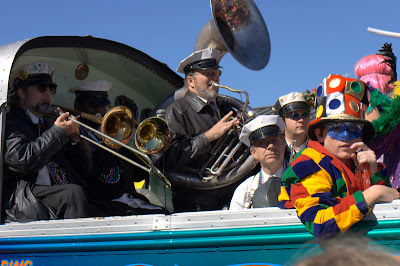 The extra excitement about this year’s Thoth parade was that my parents, in town for the Extravaganza the night before, agreed to come over for the morning and see the parade with us. 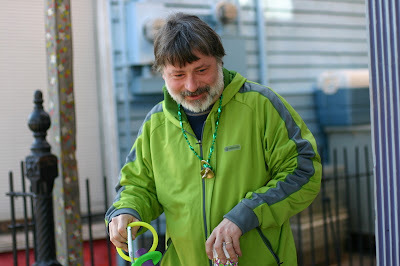 Paul and I have spent the better part of 3 years trying to convince them of the secret truth of Mardi Gras that outsiders don’t seem to get: it’s a FAMILY holiday! After what they had seen at Endymion (a TOTALLY different type of experience) and around the hotel on Canal Street (tourists) they were very leery. But they came! Despite being at the Superdome long into the night, they managed to get out of the hotel and over to Uptown. They had a bumpy morning — accented by a bird pooping on my Mom while she walked to our house and then tripping and falling on the sidewalk (no kidding). 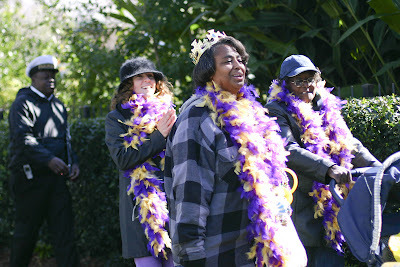 Even with their exhaustion and morning challenges, they arrived excited and ready to be a part of the kids’ Mardi Gras. And they had a great time! Finally! People believe us! 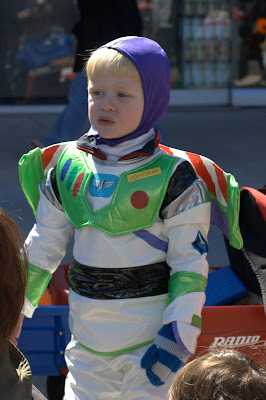 Will dressed as Buzz Lightyear! Buzz and his favorite throw… a plastic toy shark with “ETHAN” written in marker on the bottom. He LOVES it. 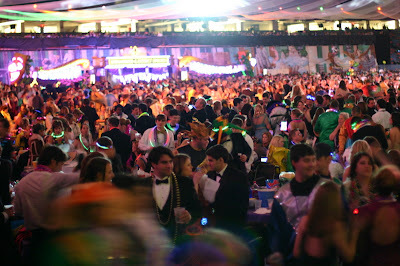 Aside from a few little outings, Saturday was all about the Endymion Extravaganza. 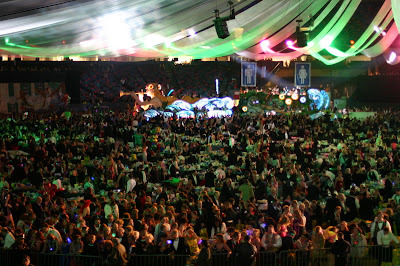 We’ve heard two numbers for attendance at the Extravaganza: 12,000 and 14,000. 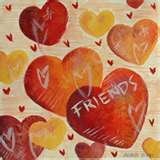 In other words, a lot of people! Getting there — in the middle of parade crowds on one of the biggest parade days of the season — was tricky. We left between parades and had to drive all the way around the Quarter and enter from the East in order to get to the Canal Place, the one place we were told we could find parking. Then we met my parents in their hotel room, finished getting ready, and rushed out into the cold night to catch our bus to the Superdome. The Superdome itself is an impressive arena. It was the first time I’d been inside. It is also the first and only time I’ve ever wondered if I was inside the Spaceship from the end of Close Encounters of the Third Kind. The Dome is a huge ring of lights that exactly mimics the movie. 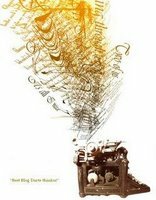 (I was shocked that we got through the night without my Dad humming those 5 notes.) The verandas were tremendous sections of scaffolding built over the Superdome’s seats going down the sides of the arena. Huge black cloths hid the seats from view and a series of stairs connected verandas at different levels. We were on the veranda closest to the floor and had a wonderful view over the room. The enormity of it all was hard to take in. We kept having to remind ourselves that there was a football field under all of it. 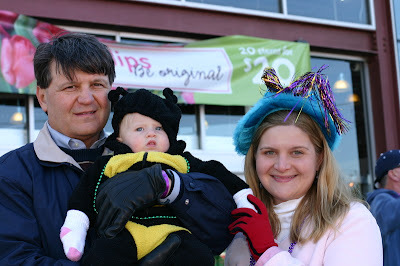 We had just enough time to eat and explore before the parade began to arrive. 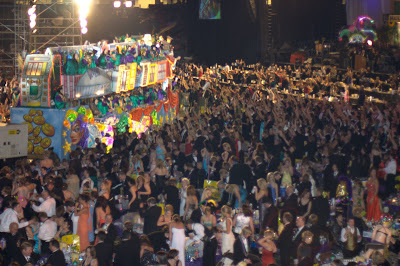 The Endymion parade leads to the Superdome, winds through it, and then ends so that the riders can depart and get the party officially started. 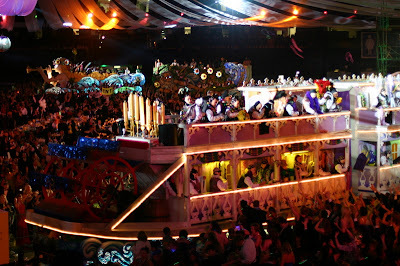 The floats used to circle the interior edges of the ‘dome, meaning that those in the verandas had the premiere spot to catch throws. This was stopped last year, after someone was killed after falling off a chair and onto the floor below. 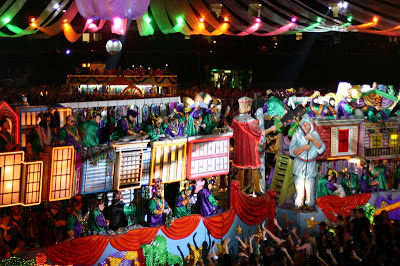 Now the floats circle through the interior of the huge floor. As the parade neared, crowds gathered at the metal fencing used to create the enormous thoroughfare. Paul and I spent the beginning of the parade on the floor in the huge crowd. I stood on a chair (fatiguing) and took photographs. When throws came our way, I ducked — they were terrifying!! Not the gentle, tossed with eye-contact throws in Uptown. After the event, we noticed that the backs of our tickets held detailed disclaimers about any number of horrifying injuries that could befall us at this party — and from those warnings, I think I was smart to duck. After awhile, we joined my parents on the veranda. Paul went back down to try and catch light-up throws for Will and I joined him for the last 5 minutes or so of the parade… and in that 5 minutes, we caught enough to fill a box. 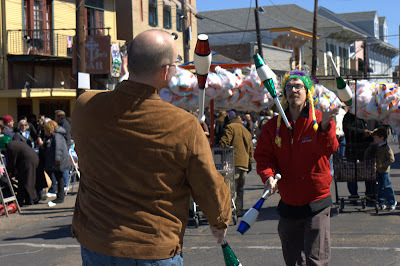 People leave this event with more throws than we have collected in an entire Mardi Gras season! 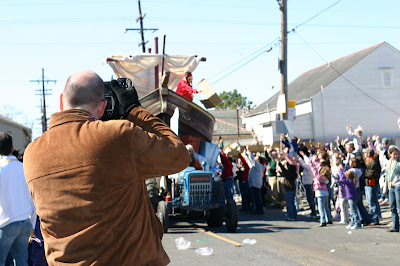 The riders, known for throwing more than any other Krewe, unload all their remaining loot at the Extravaganza… watching the amount of stuff being hurled from these gigantic, flashing, beautiful, floats is truly an incredible sight. With the lights, live music, people, fireworks (yes, fireworks! 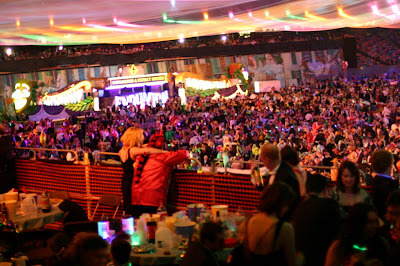 ), and unbelievable energy, extravaganza is honestly the best word to describe the experience. The pictures below do a better job of telling the visual story… what an awesome sensory overload! The crowd arriving… a football field is under all of that! Stilt walkers were included as ushers for the parade — the one on the far left is the son of friends of ours. He had also walked the 6 mile parade loop two nights before on stilts. Last year, he did the same route for several Krewes riding a 6 foot unicycle. (Seriously talented guy!) We didn’t know he would be in Endymion so it was a cool surprise! Journey was another headlining music performance. They played after Taylor (at around 2am) so we missed them as well. Styx was yet another headliner. They were the last stage show at around 3am. Yup. Missed them, too. 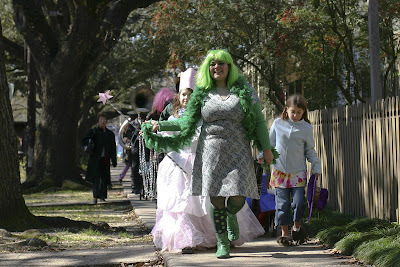 Every Krewe has it’s maidens… these ones had pretty awesome costumes! My favorite party-goers from the night! This couple (whose names I never did understand) watched the entire evening of madness from their wheelchairs on the edge of the floor. The gentleman told me that he rode with Endymion for 11 years, “in the 1800s.” I gave them beads at the end of the parade. 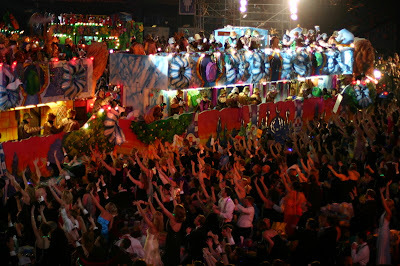 Endymion boasts “the largest floats ever assembled” and they are not kidding. Those things are GIGANTIC. They are intricately beautiful in detail and almost too much to take in, with flashing multicolor lights, themed decor, and hundreds of riders. 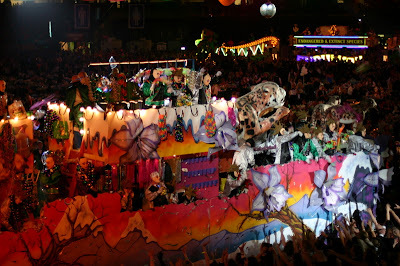 Many floats are in several parts with their own generators trailing behind them. 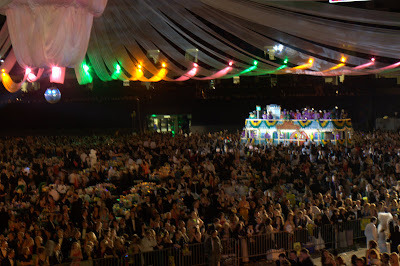 Seeing it up close helps to get the scale of how big the room is when the floats are further away… errr… downfield? 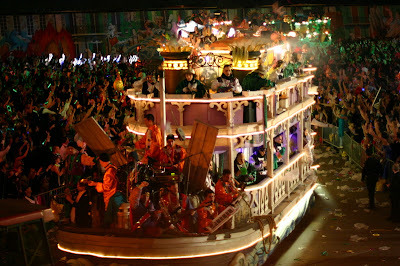 Here you can see one float way behind another. The scale is quite hard to describe. 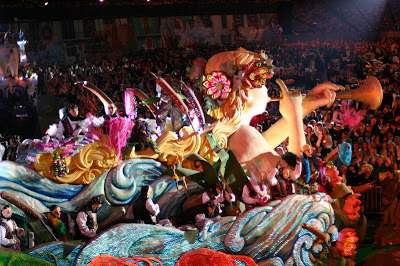 A sense of the incredible length of the floats. The crowd in front of the stage. See all those arms up? The riders actually get throws that far! 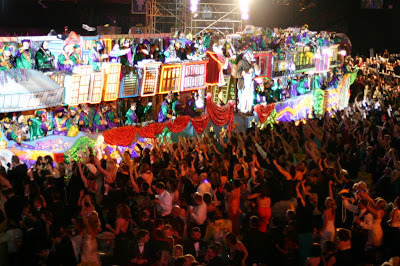 Orthopedics must get a ton of business from Endymion Krewe members this time of year. 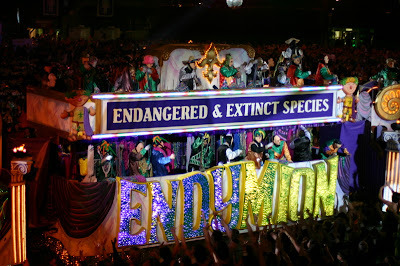 The title float, Endymion’s Endangered and Extinct Species. 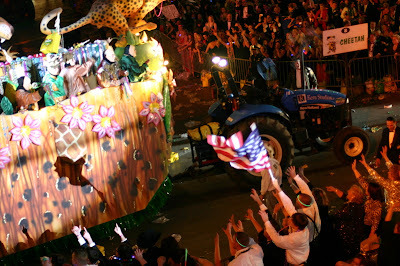 Themed floats included the Polar Bear, Dinosaurs, Whooping Crane, and others. 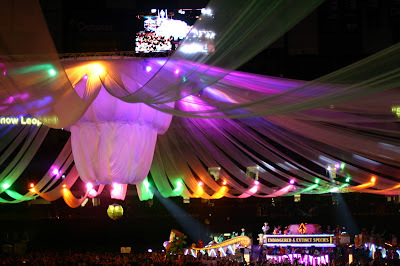 This title float sat on the outer rim of the Superdome after it wound around the crowd as a beautifully lit backdrop. 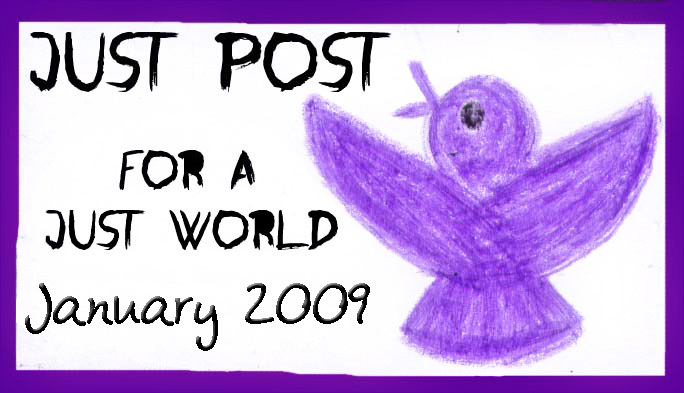 Title float in the distance with video view above. Each of those streamers were wider than I am tall. 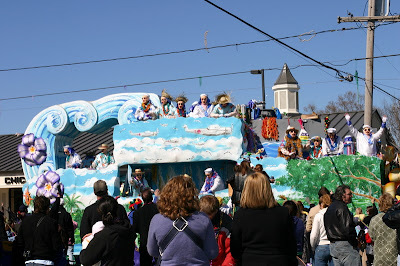 Multiple floats near and far. Catching junk… the American way…? 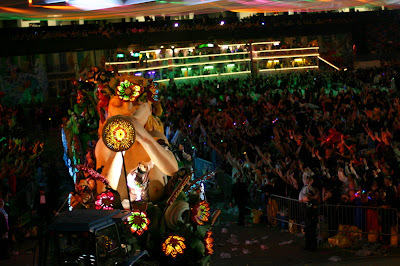 See the float lit up in the background? The lights on the floats and the spotlights in the room changed color constantly. It was a different sight at each second. Can you spot Paul in the picture below? 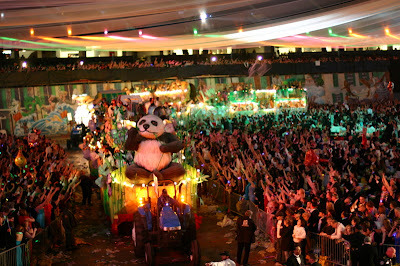 In addition to the live bands playing on stage, bands were also on many floats. Plus, the standard marching bands within the parade itself. Many layers of music floating around as the parade went by and wound through. 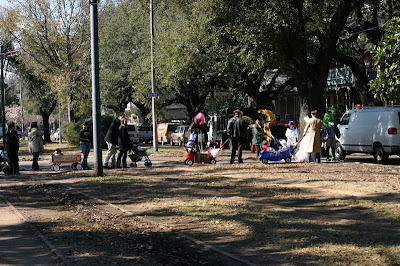 After the parade… party-goers have loot everywhere. Folks start to pack up and get ready to enjoy the rest of the night. 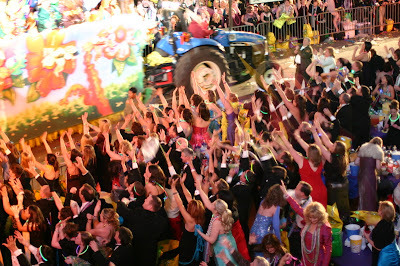 Krewe members join their family and friends as the main musical acts get ready to take the stage. Al Green was the first major headliner — he was great. We left as he was finishing up his set. Looking out from an upper balcony over one of the verandas. What a great view of all the action! It was an overwhelming, incredible night — a complete extravaganza!!! 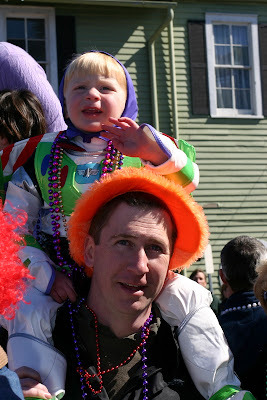 We hope to go this year… (except next time, stay in a hotel downtown and arrange for all night babysitting!!) We are so thankful to have had the opportunity to go and had an incredible time! After our thrilling morning, Paul and Matt crashed… hard. They both had been working insane hours (Paul had been pulling 10-12 hour work days 6-7 days a week for over a month — I know Matt has been doing the same) and it caught up with them. Paul got quite bad in later in the afternoon, so bad that we considered presenting at the local hospital (neither of us have family doctors since the insurance change). He’s since compared it to when he was hospitalized in 2003 under suspicion of having malaria — it makes me wonder if I should be bringing him in for a blood draw just to give the infectious disease folk something fun to look into! Public health geeking aside, he was pretty sick. 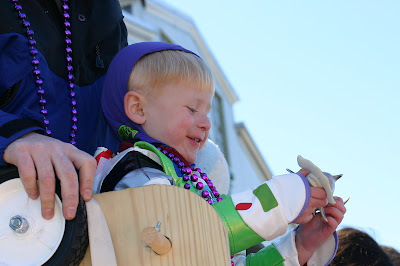 After some fluids, he was much better, but not up for parades. So, Matt, Laura and I took the kids to Napoleon. 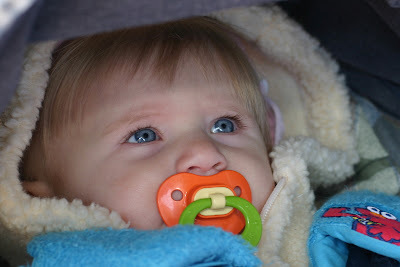 It was cold, we missed Hermes (one of my favorite parades due to the beautiful floats) and only stayed for D’Etat. Although we befriended a group and had some interesting conversations, we never really got into a good grove for catching throws and had a hard time finding a solid spot to stand. But it was still fun! More pictures of our parade route… these are some general shots (I am trying not to use photos that heavily feature other people’s kids!) and the rest will be linked from the Abeona House website later this week. 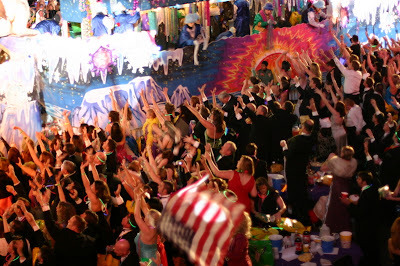 After the parade, we had the Krewe of Abeona BALL! Food from Oak Street merchants, a toast by our Queen and King, and lots of fun for all! Paul actually took a picture of me in all the excitement… Recognize a theme? I guess nursing is the only time I sit still long enough for a photograph!